Jodhpur, April 11: Two teachers were attacked with acid by an unidentified motorcycle-borne person on Thursday when they were returning home from school on a two-wheeler, police said. The victims were identified as Archana Meena and Hemlata Meena. Archana suffered burns on her back and was rushed to government hospital here, while Hemlata Meena was discharged after primary treatment, they said. Hemlata and Archana are posted at the government secondary school and government primary school respectively in village Gopalgarh in Chamu under Balesar subdivision of Jodhpur and belong to Sawai Madhopur district. “On Thursday afternoon, both were returning home on a two-wheeler after the school was over. Hemlata was driving the two wheeler while Archana was riding pillion”, DSP (Balesar) Simratharam said. 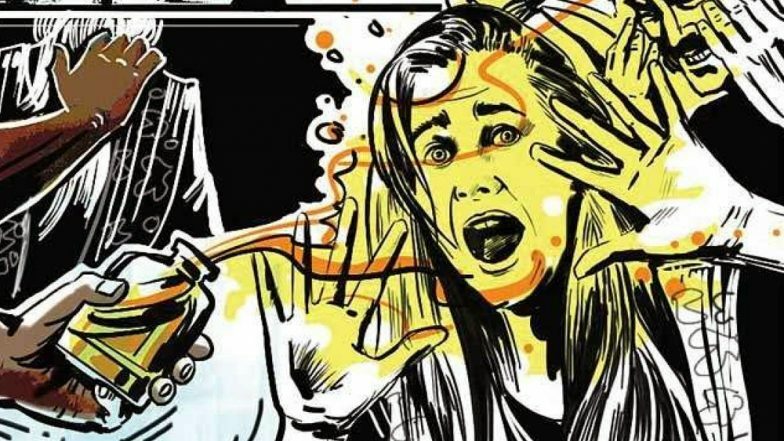 Acid Attack on Woman Police Constable in Mathura in Uttar Pradesh. He said that a few metres away from the school, an unidentified motorcycle- borne person came from behind and threw acid on them. The acid burned Archana's back while some drops fell on Hemlata's hands. According to the official, both were rushed to the local Primary Health Centre from where Archana was referred to Jodhpur. “She is undergoing treatment at the hospital and is out of any danger. We are waiting for her condition to improve for recording her statement,” the official said. Police were interrogating some suspects in the village and scanning the CCTV footage from nearby buildings. Both the teachers had been transferred to the village schools a few months back and are unmarried. They live together in a rented house in Chamu.